The recent attack on Romney based on an incident that happened in high school leaves one to wonder how low will the Obama campaign and much of the mainstream media go to discredit Romney? We are to believe that Romney bullied a person who may have been gay (even though it is not confirmed that the person was gay or that the incidence actually happened since some of the eyewitness accounts have been shaky at best.) The media, still deep in Obama's pocket, pushes the story of Romney, the young bully; but as Paul Mirengoff of PowerLine blog asked, what do we know about Romney the man? He relayed a story about how Romney befriended a neighbor and his children who were seriously injured in an auto accident. Throughout the children’s life, he helped raise money for their health care while using his own resources to aid them, and this continued into adulthood. This included helping with the children’s college education. 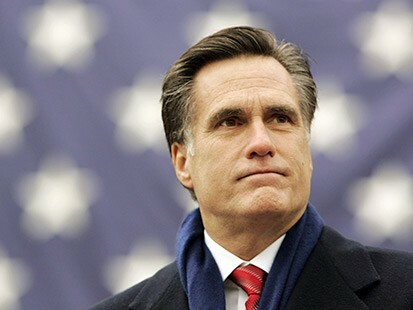 This is the same Romney, along with his sons, saved the lives of a family involved in a boating accident. He also saved the family dog (just in case you still think that Romney hates dogs). And this is the same Romney who closed down his business office and instructed his staff to help with the search for one of his workers' daughter who disappeared. As it turned out, they located the daughter but just in time as she was near death. This doesn’t mean that Romney will make a great President or even a good one, but it does show that he is a man of character. Contrast this to Obama who once declared blue collar workers of his own party as God and gun clinging xenophobes, or according to one former New York Times Reporter, he told staff members that he was smarter than them. Modesty is hardly a virtue practiced by our President. If we need to judge a person by what they did in high school, what do we make of Obama, who by his own admission loved to smoke dope? I would not disqualify a person for the Presidency just because he experimented with marijuana in high school some thirty years ago. To do so would be to disqualify a whole generation of potential politicians both right and left. The left's campaign against Romney is to betray him as one of the 1%, a bully who picked on gay students (even though this story is collapsing), a member of a religious cult, had relatives who were polygamists, and a dog hater. This lasted as long as it was noted that his opponent ate dogs and had his own family history of polygamists. The bully charge coordinated with Obama’s own announcement of his support for gay marriage, but this only shows the corruption of the media not the truth of who Romney is. The media attempts to make Romney out to be some despicable human being. Is the media merely acting as an appendage of the Obama campaign? Let's face it, this is a man who once saved the life of a family in danger of drowning and a man who helped a neighbor in need when an accident left their children as a quadriplegic. If given a choice between a man who has actually given to charity and gone out of his way to help others versus a man who talks of charity but insists that it comes from government; I will prefer the man who actually plows his resources and his time.